I just had a telephone interview with a reporter from a San Gabriel paper (I’m not sure which one). They are doing an article on the San Bernardino Freeway, and came to me as an authoritative reference. Today’s online Los Angeles Times has a link to a very interesting featured graphic (PDF) on the history of highway innovation. 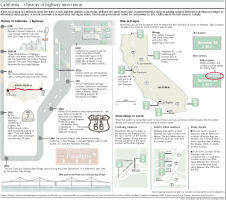 On the bottom of the graphic, they list their sources… including the California Highways Home Page, which I maintain. Woo-Hoo. I’m a source for the LA Times! Update: It’s worse. I’m linked from the front page of Yahoo! For some reason, the last week or so, things have finally been clicking. I’ve been more focused, and except for the days where I have a proto-migraine, I’ve actually been getting good stuff done, and Making A Difference. I actually attribute this to cutting out the melatonin, which I had been using to get to sleep. It seems to leave my head clearer in the morning. This was brought home to me today at work, when I found an inter-office envelope in my inbox. In it was a letter from a Senior Vice President, introducing a commendation letter from Christine Anderson, and adding his personal thanks for a job well-done by “going the extra mile”. The commendation letter talked about my outstanding support, and how my expertise was essential in, effectively, the successful fielding of the system. This is the kind of recognition that I like! There are times at work where I feel I’m just marking time. Here to answer questions. These usually occur in the lulls. At these times, you feel like you’re not getting anything done. Luckily, the universe sometimes conspires to bring you up when you’re down. (Daniel) provided highly responsive security engineering support to the CCS-C program in resolving a problem that severly impacted the program’s transition schedule. When the problem was identified, Daniel developed a detailed security risk analysis and provided direct inputs to position papers and briefings presented at the AFSPC Vice-Commander level. In addition, he developed a comprehensive report for review at the DISA/NSA level. His assessments and industry reputation were directly responsible for the system’s return to operations in the least amount of time.